Day 6 of the tour takes us to the French Atlantic coast at the Bay of Quiberon. 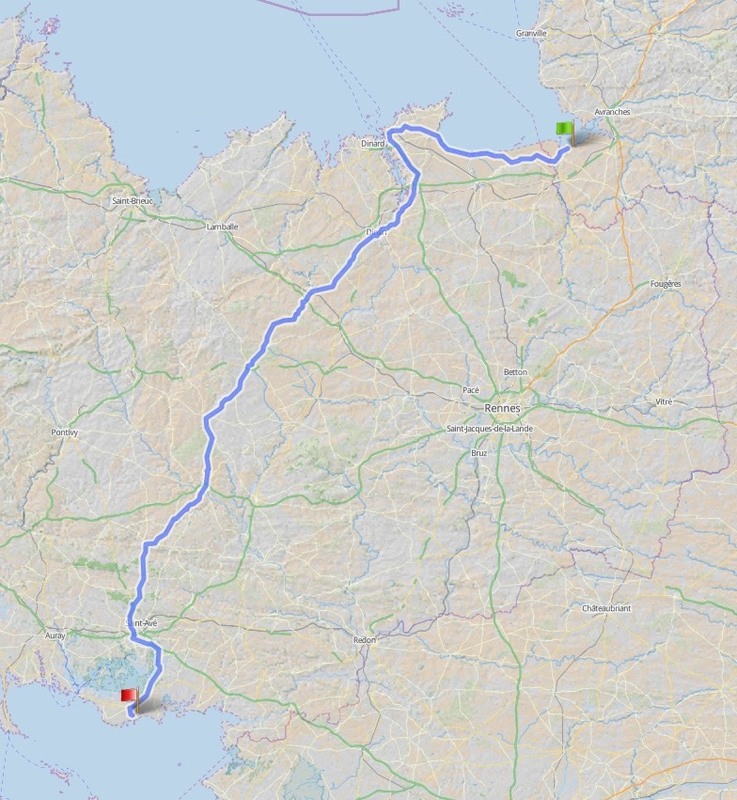 First, however, we warm up rolling along the coast towards St Malo to take in a bit more of the maritime spirit in the countryside and at the city of St Malo. 45 km into the ride, it will be a perfect place for breakfast by the harbor. Up on the hills we will follow the long fjord La Rance to reach Dinan and to head across Brittany over to the south coast. Across plenty of countryside and through small villages we will go either up or down, but climbing is never really long. The biggest climb for the day is about 100 m of elevation gain. On the other hand, there will be some wild downhill runs, which could only be spoilt by traffic and intersections, such as the last one right before we get to Vannes, descending about 110 m.
Josselin, about 150 km into the ride, located down in a river valley, looks like the best place for a lunch break. Vannes is the largest town before the holidayland around the many bays and islands where we will spend the night, the place to shop for special shopping needs. The last 25 km will be mostly flat or small hills until we reach our campground fairly close to the beaches.